Today I’m gonna talk about a great “save your hide” warlock trick. Well maybe it’s not “omg” great but it is another trick and we, as warlocks, should always have good tricks up our sleeve. Now, it will require keybinding and being able to move with your mouse. Clicker types can try it but it will be very difficult to pull off. It’s a variation of a hunter trick first talked about by the famous WoW hunter and blogger extroardinare named Big Red Kitty (a.k.a., BRK). All we are going to do is steal…er… “borrow” the idea and instead add our beautiful green Fel-Flame spell to it. Then voila! We locks have the Fel-Flame Jumpshot. I don’t know if any of our other bretheren Warlocks are already doing this but I did it in front of a friend on a battleground and he loved it. I don’t recommend replacing it over our other great arsenal of spells if you have them available. So read about it, try it out and I’m sure you will find situations where it can be helpful. Fel-Flames - Yes it's a pretty green fireball but like many good warlock tools it's all about timing and movement situations and where best to use it. Plus it's also good for frying nearby critters! So what is the hunter Jumpshot Fel-Flame Jump Shot (FFJS) and how does it work? It’s simple. 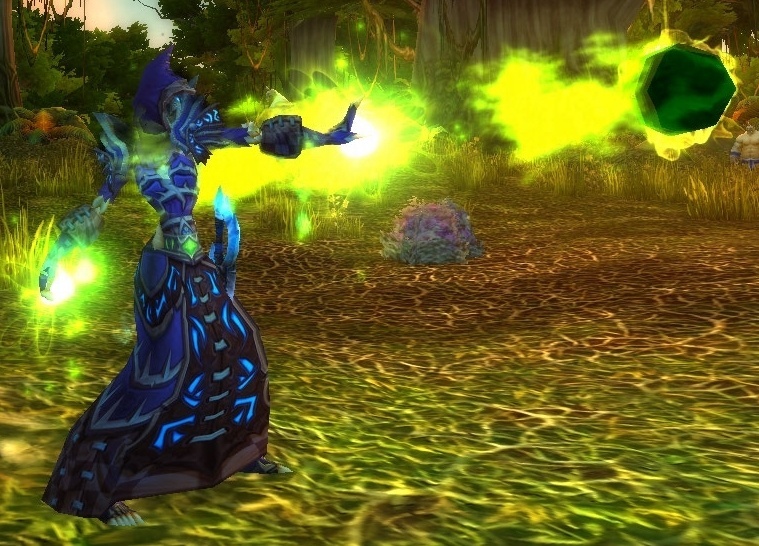 As you already know, Fel-Flame should only be used when movement is required or if you have a mouseover macro from Cynwise’s Battlefield Manual and are making enemy Shamans cry bitter tears by quickly destroying their little totems that cost them their precious mana and time to throw down. The importance of Fel-flame doesn’t really come from it’s direct damage. Sadly Q-Tips, if used properly can be more painful than Fel-flame damage. Where the importance of the Fel-flame spell comes from is that it’s instant, does mild damage and can be used on the move to extend the DoT duration for both our Immolate and Unstable Affliction spells by 6 seconds. I love how Sorcereo from the WoW Warlock Forums called the Fel-flame spell his S.I.C.C. (Spontaneous Instant Critter Killer – cute, I know and probably a good way to use it). But for this trick, what we’re going to do is take our semi weak Fel-flame Spell, add a forward moving spinning jump to it and it and now it becomes a great situational tool. Here is the situation: Say you are being attacked and all of your CC’s are on cooldown. Your Doomguard or Infernal has already been spent…your low on mana and low on health. You would use your Demonic Portal if only it wasn’t back in the middle of the fray swarming with enemies who are at full health. (You know this because you always lay down your portal right?) You’ve popped your cookie and a health pot. Things appear that they might not bode well at this moment. If you Lifetap it will make the situation worse because your enemy is closing in on you fast despite your DoTs ticking on them. If only you could just buy yourself a precious few seconds to make it back towards your GY where you know other teammates are respawning. If only you could kite your enemy long enough to outlast them then you might stand a chance as long as your DoTs have time to do what they do best…increase with time. What would you do? Any thoughts? Pull out your wand and take it like a brave Warlock bitter until the end? Heck no! You run! Yes you heard me. Run! Start running away from your enemy. Yes, I know as warlocks our enemies should flee from us but sometimes in a bad battleground group this happens. Like I said this is situational. I’ll say this again for the full affect but instead I’ll bold it, “This is situational”. Okay now where was I? Oh yeah, start running away from your enemy. As you run in the opposite direction from them you jump and while you are in mid-air you spin around, fire off a delicious Fel-Flame in their face while you continue spinning and land still running in the direction you started. This is all done in one jump while continuously moving. When you land you can rinse and repeat. If your enemy doesn’t have any speed increases to pop you can literally kite and kill your enemy doing just this manuever. Muahahahaha! (add your own cackle laugh here). So what we are effectively doing is taking a hunter’s jump shot and stealing borrowing it for our own benefit and evil intentions, but instead of using a cheesy arrow or bullet we’re using our pretty green flame to instead burn those beneath our stature. What’s nice about the hunter jumpshot Fel-Flame Jumpshot method is that you can also use it to toss out DoTs like your curses, banes and corruption spells. Take any of your instant cast spells and just apply the same technique and you can kite your enemy effectively until their health ticks away or until you can buy yourself some extra time for better positioning. If done correctly your green flames and DoTs will drop their health quickly and they will lose hope at your cleverness realizing once again they have been outplayed by a master. Hopefully this method will help you out in a pinch when your low on life, gcd’s and mana. A good way to practice this trick is when your running around doing dailies or either on foot or on a ground mount. What ever direction your headed just press jump, spin your toon in a full circle while your still in the air and land still moving in the direction you were heading. Pretty soon you will get the timing and feel for it to where it’s just one long fluid movement on the screen. If you would like to see what this trick looks like in action then head over to www.warcrafthuntersunion.com and check out the hunter “Jumpshot” video. Frostheim and the folks over there do a great job even if it is for all things huntery. This is an excellent skill to have as a Warlock (or any class, really). I learned to jumpshot Death Coils from Pikestaff, an ex-Hunter blogger, and it saved my hide plenty of times. Keybinding: Is it that important?